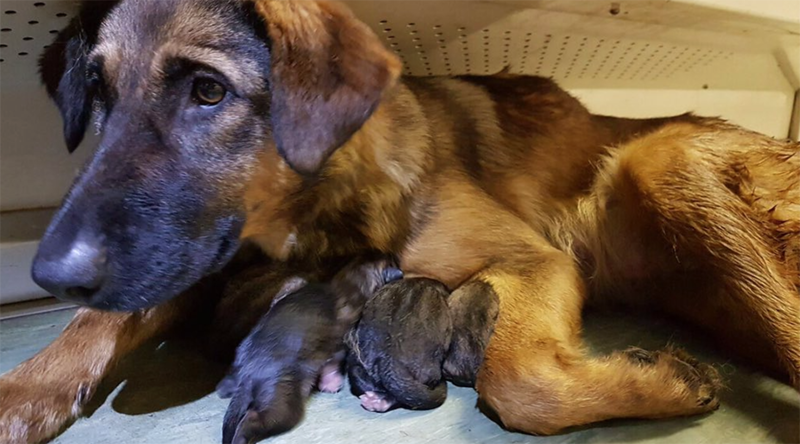 Passengers in Moscow metro have witnessed a touching scene when a pregnant dog crawled into the train car and gave birth to nine puppies. The Moscow metro is now asking its Twitter followers to adopt the pups. The happy event took place on a Monday morning metro ride. Passengers saw a homeless dog that had crawled into the car, apparently asking for help as she was getting ready to give birth. Passengers in the carriage called metro personnel, who arrived at the scene to find out that the dog had already given birth to one puppy and was getting ready to give birth to its brothers and sisters right there in the carriage. #meanwhileinrussia this doesn't normally happen on your daily commute. Tag anyone who needs something positive this Tuesday! A video released by Life.ru news portal shows passengers providing the future mom with a spare place. The footage then depicts the birth of the puppies and she is seen licking her pup which merely looks like a small ball of black fur. “The whole [train] car was moved when she gave birth,” one eyewitness told Life.ru. Metro personnel asked the passengers to leave the train and to wait for the next one (the intervals between trains in Moscow metro are less than 1 minute in rush hours). The train car with the dog was transported to the train depot. In the end, the dog managed to give birth to eight puppies. People who want to adopt the pups have been asked to contact the Life.ru portal, Moscow Metro or Zoorassvet animal shelter in Moscow, where the happy family is currently living. “Mom and puppies can’t be separated, and the dog with its offspring was sent to Zoorassvet animal shelter,” an official from Moscow metro Andrey Kruzhalin told Rossiyskaya Gazeta newspaper. “Moscow Metro, we respect what you have done,” said another.